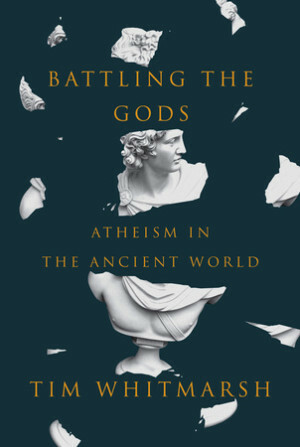 Battling the Gods: Atheism in the Ancient World, by Tim Whitmarsh – This book is partially a response to the idea that atheism is a new idea, a product of the age of science and reason that turns against ancient superstition. Both believers and non-believers sometimes promote this, but Whitmarsh demonstrates that atheism is actually a quite old concept, focusing on his own area of expertise in ancient Greece. That said, atheism was approached somewhat differently in those days. The Greek term atheos originally meant “god-forsaken” rather than “not believing in the gods,” but it developed over time. Whitmarsh also writes of the notion of theomakhia, or battling the gods. He mentions the story of Salmoneus, and how the traditional reading is that of the king being excessively proud and trying to elevate himself to the level of the gods, but it can also be seen as reducing Zeus to the level of humanity. After all, if Zeus’s main power lies in his ability to create thunder and lightning, and mere mortals can imitate that, is he really all that great? While most myths of humans challenging the gods had the moral that they shouldn’t bother because the gods will always win, it was also a recurring theme that the gods were not infallible and could in fact be pretty stupid at times, and that their power was relative and relied on their being able to defeat all challengers. Many philosophers contributed their own ideas about whether the gods were necessary and how they should be understood. The Ionian philosophers Anaximander and Anaximenes proposed natural explanations for what was normally ascribed to the gods. Xenophanes of Colophon believed in divinity, but not in the tradition of humans to give their gods features just like theirs. Socrates was accused of atheism for not acknowledging the gods of Athens, even though he did believe in divine guides for people. Euhemerus proposed that the gods were just ordinary people who had been deified. Epicurus is probably best known today for his statement about gods and human suffering. Basically, he said that a god that could prevent evil but won’t would be malicious, while a god that couldn’t prevent evil is hardly all-powerful. The book continues to track atheist thought through the rise of Rome, and argues that the adoption of Christianity largely killed mainstream atheist thought for some time. This new religion tended to lump atheists in with polytheists and heretics rather than making them their own category. I’ve frequently seen it asserted that everybody is an atheist with regards to certain gods, although this wasn’t so much the case in pre-Christian Rome, which tended to welcome as many deities as possible. While there are still polytheists, pretty much everything today is filtered through the lens of Abrahamic-style monotheism. While it’s certain theologically sound to believe that gods exist but are total jerks, it’s not a belief I’ve come across much. Sure, people point out the nasty parts of religion, but these are usually either people who don’t believe it at all and see it as a purely academic exercise, or religious people who see such views as antithetical to their own conception of a good God. It’s interesting to see how old many atheistic arguments really are, but it seems telling to me that some of them still hold up today. Retromancer, by Robert Rankin – This follow-up to The Brightonomicon has the young Jim Pooley once again teaming up with Hugo Rune to go back in time and prevent the Nazis from winning World War II with the aid of Rune’s arch-nemesis Count Otto Black. Rune and Black are linked because the latter removed his name from the Book of Life so he could never die, and Rune’s name was on the opposite side of the page, making him immortal as well. Of course, it’s never entirely clear how much of what Rune says is actually true. He claims to have been Merlin back in the days of King Arthur, but another Rankin book posits that Professor Slocombe was Merlin. There are some pretty creative and funny ideas here, and we finally get to meet Pooley’s father, but it largely suffered from the same fate as its predecessor in the solutions to things pretty much always coming out of nowhere. Granted, the characters acknowledge this, but at the same time I feel that many of Rankin’s other books at least have plot threads you can follow even if they are totally far-fetched. I wouldn’t recommend this as a stand-alone, but if you’re familiar with Rankin’s work, it’s a nice return to his recurring characters and running gags. 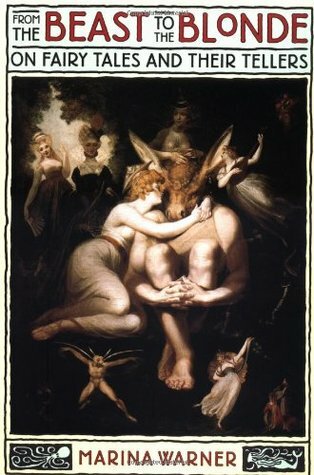 From the Beast to the Blonde: On Fairy Tales and Their Tellers, by Marina Warner – This book addressed so much that, while it was an interesting and enjoyable read, I find it difficult to remember any specific points I liked. Warner covers the evolution and messages of various fairy tales, with an underlying theme about how they often provided a voice for women in a misogynistic society. Many ancient themes that would be incorporated into fairy tales are brought up here, including the Sibyls of the Roman world, tales of the Queen of Sheba’s visit to King Solomon, and the accounts of saints’ lives. The book tackles the recurring themes of absent mothers, weak-willed fathers, evil stepmothers, and the seeking of forbidden knowledge. A lot of attention is focused on tales of the Bluebeard and Beauty and the Beast type, where a woman is the central figure. They’re sort of opposite takes on the same story, with the former making the husband into a horrible person, and the latter presenting the beast form as not reflective of the husband’s true nature. Also, Bluebeard’s wife is punished for her disobedience (although, as has been often pointed out, the guy would have still been a serial killer even if she hadn’t looked into his forbidden closet), and only saved by the fortunate intercession of her brothers. In stories like that of Cupid and Psyche, sort of the ur-example for such tales, the woman does what she isn’t supposed to do but is still able to redeem herself in the end. Warner’s style involves giving a lot of examples of each theme she deals with, which can be fascinating but sometimes a little hard to follow. This entry was posted in Authors, Book Reviews, Christianity, Fairy Tales, Feminism, Greek Mythology, Greek Philosophy, Hellenistic Greece, History, Humor, Mythology, Philosophy, Religion, Robert Rankin, Roman Empire and tagged anaximander, anaximenes, atheism, battling the gods, beauty and the beast, bluebeard, count otto black, cupid and psyche, epicurus, euhemerus, from the beast to the blonde, hugo rune, jim pooley, king arthur, king solomon, marina warner, merlin, monotheism, polytheism, queen of sheba, retromancer, salmoneus, sibyls, socrates, theomakhia, tim whitmarsh, xenophanes of colophon, zeus. Bookmark the permalink.